Not many people have heard of City "Chicken". 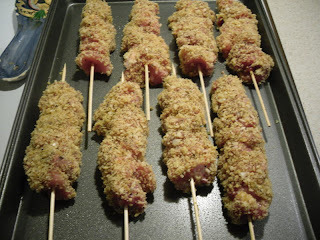 It is not chicken at all, but breaded pork and veal skewered. I was introduced to City Chicken years ago by a relative who lived "up the lake" in Pennsylvania. After some research, I discovered that an overwhelming majority of people who have heard of this dish live in regions of Pennsylvania. There have been some sightings in Milwaukee, Sheboygan and Detroit. I recall when we were there for an overnight stay, Mary chopping up lots of garlic, adding it to the veal and pork cubes and marinating this overnight. I marinated the meat with the garlic for an hour. 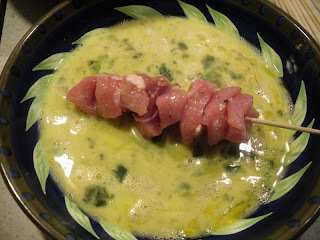 Her husband made her "special" skewers or dowels especially for her City Chicken. Most wooden skewers come 10 inches long and I had to cut them down to 8 inches to accomadate my frying pan. The original recipe originated during the depression when chickens were expensive. Pork and veal were substituted and fashioned to look like a drumstick. It's the kind of dish you would expect Aunt Bee from Mayberry to serve Andy and Opie - Shazam! Of the few recipes I've found, most of them used cracker meal for the breading. 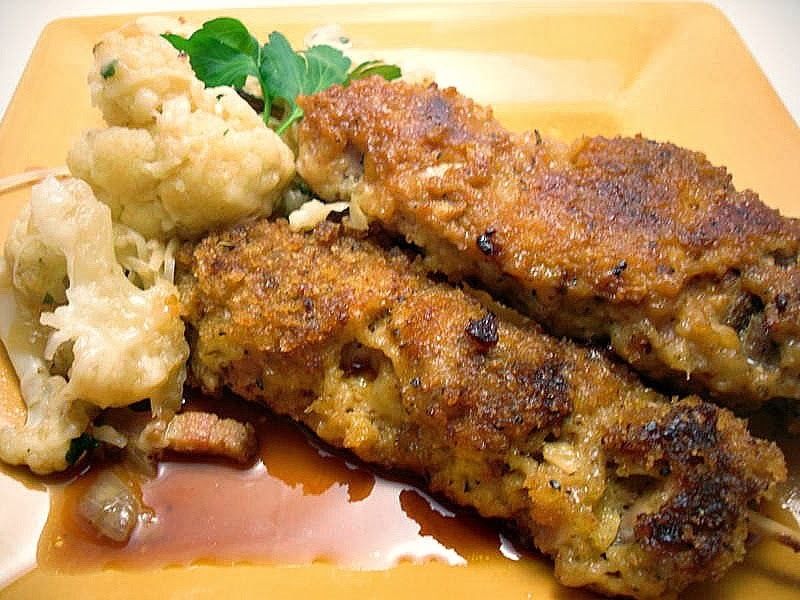 I've updated it by replacing cracker meal with seasoned panko crumbs. Cut veal and pork into cubes. 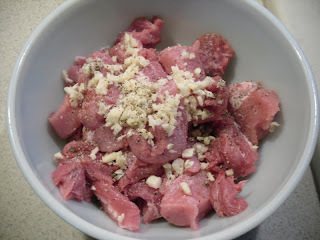 Add minced garlic, cover and marinate at least one hour or overnight. Thread skewers alternately with pork and veal pushing the pieces tightly together. In a shallow bowl, mix egg, milk, salt and pepper. 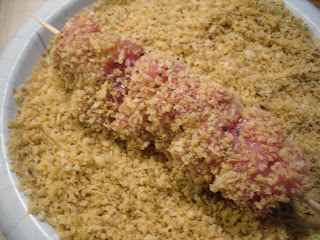 Dip skewers into egg mixture, then in breadcrumbs to coat. Let rest 10 minutes to set. In a large skillet, heat oil until hot. Add skewers and saute about 4 minutes, or until browned on all side. Place in shallow baking pan and add chicken broth. Cover with foil and bake 1-1/2 hours until meat is tender. Remove foil last ten minutes of cooking time. I needed to add a little more chicken broth towards the end of the cooking time. Serve with mashed potatoes and pan juices. My Sunday Gravy and a visit to the "Cake Boss"